If you have ever driven across the desert west of the United States and noticed occasional fields of bright green grass, chances are you saw alfalfa. Alfalfa is one of the oldest cultivated plants. 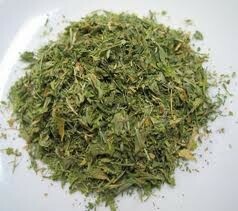 It has been used for centuries for hay, but it has also been used for centuries as a human food. Its name comes from the Arabic, al-fac-facah, "father of all foods." If you answer no to the question "Got milk" you should answer yes to the question "Got alfalfa" Alfalfa is one of the best natural sources of vitamin K. This nutrient helps blood to clot by moving calcium into proteins that form a microscopic net to capture red blood cells. Vitamin K likewise helps bones to knit by working with vitamin D and glutamic acid to activate osteocalcin. The combination of these three nutrients is essential to building good bone. Your body can not use calcium without it.